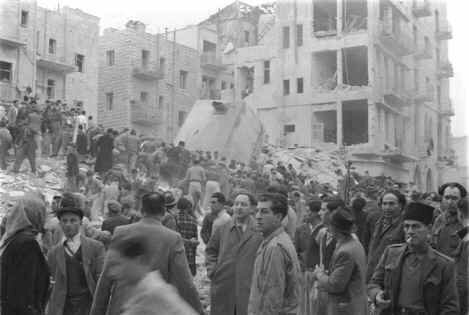 Ben Yehuda Street Bombing -On February 22, 1948, during the first phase of the Israel War of Independence, Palestinian Arab terrorists, with the cooperation of deserters from the British Mandatory forces, bombed Ben Yehuda Street in Jerusalem. 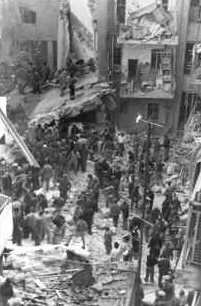 It was possibly the first car bombing in history, and it was the first of several bombings of Ben Yehuda street in the history of the Israeli-Palestinian conflict. On February 22, 1948, at about 6:30 in the morning, three men dressed as British soldiers and police drove to the corner of Ben Yehuda and Ben Hillel Streets. They passed through British and Jewish checkpoints with no problems, owing to their seeming British identity. One of these men was Azmi Djaoumi, a Palestinian Arab. The others were Eddie Brown and Peter Madison, British deserters. They were driving an armored car and two truck bombs loaded with explosives, prepared by SS-trained Fawzi el Kuttub, the master saboteur of the Arab Palestinians in Jerusalem. The bombings had been ordered by Abdel Khader El Husseini, who intended to terrorize the Jews into leaving Jerusalem. Brown and Madison had previously carried out the Palestine Post Bombing. For the Ben Yehuda bombing, they were supposed to get a thousand pounds sterling from the Grand Mufti Hajj Amin Al Husseini. The bombers lit the explosives and fled. The explosion demolished four buildings and shattered windows in a large area. Various casualty figures are given. According to Collins and LaPierre, 1973, 54 people were killed. According to Yair Sheleg (2001)52 corpses were found under the rubble and 32 people were injured. Six of the injured died subsequently. Yitzhak Levi (1986) listed 47 dead. According to Levi, 1986 (p. 440), casualties were: 2 soldiers killed, 14 wounded, 47 civilians killed, 126 wounded. One of the trucks had been parked near the Atlantic Hotel, at the corner of Ben Hillel and Ben Yehuda Streets, where the "furmanim," those who guarded the Palmach convoys, usually stayed. British police chased the attackers, but they cried out "Explosion!" The fact that they seemed to be all British misled the police, who anyhow preferred to get away as soon as possible. Dr. Meron Benvenisti, a boy of 14 at the time, relates that he arrived at the site of the explosion with friends from the youth movement; they were asked to help clear the rubble. "The British offered earth-moving equipment, on condition that they themselves operate it," he recounts, "but the Jewish Agency refused, so that's how they brought us in to do the work. I remember that I bent down to clear something and suddenly I saw a human hand sticking out of the rubble. This is a sight that I will of course never forget. The roof of the Orion Cinema, which was located nearby, was blasted off entirely by the force of the explosion, and for years the cinema had only a tin roof, and when it rained you couldn't hear the films that were being screened." Rescue workers at the scene of the Ben Yehuda Street bombing, 1948. A contemporary personal account of the devastation and rescue work is given in Palestine: Ben Yehuda Street Bombing Palestine: Ben Yehuda St. Bombing 1948 - Fierce Determination . Madison and Brown went to Cairo to get their reward, but the Mufti laughed at them and refused to pay up. Though Abed al-Kader al-Husseini announced to the press that it was he who was responsible for the attack, the Supreme Arab Committee, which was afraid of international censure, released a statement, authorized by the Mufti, denying Al-Husseini's announcement. This pattern of maintaining deniability was to be imitated by Palestinian Arab terrorist groups in the future. Ben Yehuda Street and nearby Zion square have been the site of additional Palestinian terrorist bombings. On Friday, July 4, 1975, a refrigerator with five kilograms of explosives packed into its sides exploded in Zion Square. Fifteen people were killed in the explosion and 77 were injured. On September 4, 1997, three suicide terrorists of the Izzedin el Qassam military organization of the Hamas blew themselves up simultaneously along the pedestrian mall, killing four Israelis including two 14-year-old schoolgirls. On December 1, 2001 two suicide bombers detonated themselves on Ben Yehuda Street, followed by a car bomb that went off as paramedics arrived. Ten people were killed, including many children, and 188 were injured in the terrorist attacks. Numerous other attempts were foiled. Collins, Larry, and Lapierre, Dominique, O Jerusalem!, Pan Books, N.Y. 1973, pp 180-183. Levi, Yitzhak, "Tisha Kabin" (9 Measures) (Jerusalem in the War of Independence, (in Hebrew) Maarachot - IDF, Israel Ministry of Defense, 1986, p. 440. Sheleg, Yair, A short history of terror. Haaretz.